Powerless went through a more-than-usually-tumultuous retooling before it came to us in its present form, so it’s tempting to cut it even more slack than the usual new series. Luckily, the show is blessed with such a colorful toy box of unique comic talents that, so far, it’s pretty easy to just enjoy the fun, no matter how all over the place the writing and tone have been in these first episodes. (Maybe it’s the similar color palette, but I feel like I’ve been spoiled by the fiendishly constructed narrative perfection of the first season of The Good Place.) At any rate, as long as you’ve got comic actors like Danny Pudi, Christina Kirk, Jennie Pierson, Ron Funches, and Alan Tudyk on hand, there’s always something eccentrically entertaining going on. Tonight, it’s Tudyk’s turn to shine, with a generous side-helping of Funches, as Wayne Security pursues a contract with the underwater city of Atlantis, and Ron becomes convinced that one of his coworkers is secretly the superhero, Olympian. Tudyk also gets to sing, an appropriate trait, as Van seems exactly like the kind of guy who will invite you over just so he can noodle the same few chords he knows on an acoustic guitar. After Van’s told off (Van Sr. punishes him by withdrawing the “last remaining shred of respect” for his son), Emily comes into his office just in time to catch the refrain of his latest ditty, “Daddy issues, need some tissues,” and Powerless plays up the paternal angle as a way to bond the two characters together. 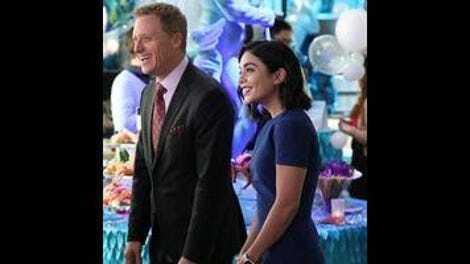 The series has established Emily’s perhaps overly rosy memories of her loving florist father as her main character trait (after Vanessa Hudgens’ natural, well-scrubbed cheeriness), something Van calls her out for, repeatedly. (“You never speak of your mother. 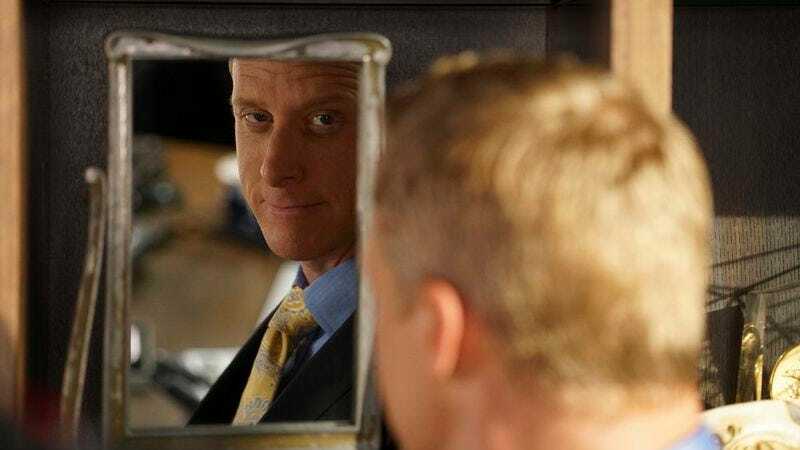 Did you drive her to suicide with these stories?”) And Powerless has yet to punch through each of its characters’ one or two defining characteristics. Still, the Van-Emily team-up here does double-fisted duty in humanizing both characters, as the hyper-competent Emily overcomes her disdain for Van’s little rich boy entitlement to lay the groundwork for a deepening understanding between the two. Van’s still an idiot, and Emily’s stated quest for a mentor like her dad is unlikely to land on Van, no matter how many faked-up bottled of priceless brandy he has Jackie whip up to seal big deals as he does with the Atlanteans. But Hudgens and Tudyk work well together, and it’s a start. The B-plot is a lot of fun, both for Ron Funches’ irresistible silliness as the irrepressibly childlike Ron, and the way it looks a little deeper into what living in a world of superheroes might mean for workplace intrigue. When hunky coworker Alex (Matthew Atkinson, impeccably Clark Kent-ish) keeps disappearing every time the Olympian zooms past the office windows to save the day, Ron becomes obsessed with proving that there’s an alter ego situation happening right under everyone’s noses. (Kirk’s Jackie does some funny mooning over Alex, responding to Ron’s, “You don’t think..?” with a dreamy “About him naked? Yes, I do.”) Ron’s plan, involving diligent bathroom surveillance (complete with secret camera) and a plan called “Operation Fake Lady Getting Mugged” (consisting of him yelling “Oh my God, there’s a real lady getting mugged!” within Alex’s earshot) proves inconclusive. Luckily (although not for Alex), Jennie Pierson’s lab wildcard Wendy settles things when she busts a chair over Alex’s back, and he crumbles into a decidedly human heap. Let’s play Name That C-lister! This week, the big story is that Charm City is also home to The Olympian! Try to contain yourself. In the comics, Olympian was a founding member of the Global Guardians, the little-seen junior Justice League of European, Asian, South American, Australian, and African superheroes that Powerless seems prepared to plunder for colorfully cost-effective heroes unlikely to get their own movie or series anytime soon. Like a lot of Global Guardians, the Greek Olympian has some one-note ethnically derived powers, in his case, the Golden Fleece, of Jason and the Argonauts fame. It gives him essentially Superman abilities, plus shapeshifting, mind-reading, and even super-memory, which is probably useful in some way. Here, we see The Olympian fly, and carry a school bus. No sign of the Fleece, although he does have a swanky purple shawl and the requisite golden helmet. Ace Chemical is where, in most versions of the Joker’s ever-malleable origin story, the man who would be Joker fell into a disfiguring vat of toxic chemicals. Here, Ace was the first client signed by Van’s father, making Wayne Industries’ fate intertwined with the Joker’s even further. Ron jokes that another cause of supervillainy is “losing the popular vote but somehow winning the election,” and everyone laughs and laughs. In addition to Marv Wolfman, Charm City’s news media boasts an anchor named Gail Simone. In our universe, you should read her runs on Secret Six, and Birds Of Prey. Just sayin’. The cold open returns to Powerless’ running gag that Emily’s small-town unworldliness is—sometimes rightly, usually not—called out as racist. The conceit hasn’t really landed yet, although the idea that Ron calls her out for thinking he’s from Atlanta rather than his revealed homeland of Atlantis opens up a whole can of worms. (William H. Macy also hails from under the sea, apparently.) I mean, can Ron breathe underwater? What’s that whole story? And, see? “A whole can of worms” is, when talking to an Atlantean, probably a little racist, considering that Ron has to take Emily to task for using the phrases “We hooked ‘em, so let’s go reel ‘em in” and “good catch” when discussing the Atlantis deal. Apologies. The Atlanteans are impressed that Van’s “Sinking Day” party (commemorating the day Atlantis sank beneath the waves) includes an anatomically correct statue of their legendary King Orin. I like researching DC as much as the next geek, but I’ll let you discover if Atlanteans being traditionally “half-circumcised” is a thing. And also what that means. Atlantis also reveres the cinematic oeuvre of Brendan Fraser, which, why not? Wendy’s chair-assault aside, Alex and Olympian are played by the same actor. Hmmm. Maybe chairs are Olympian’s kryptonite. Ron also theorizes that that Bruce Wayne is really the Flash and Stephen Baldwin is just a character played by Alec Baldwin. So close on the former. And can you remember the last time you saw Stephen and Alec together? I can’t.